When I was planning this week's posts, I asked doop and bob if mapo tofu was too boring a dish to post about. Apparently it isn't! Tofu-hater bob characterises it as "making tofu actually tasty", which is something of an achievement in his opinion. The literal translation of 麻婆豆腐 (má pó dòu fu) is "pockmarked old woman's beancurd". Various versions of the story behind the name can be found all over the interweb; here's one. 婆 (pó) is a respectful title for "grandmother" or "old woman", and as mentioned on Wednesday, 豆腐 (dòu fu) is tofu. 麻 (má) is the "pockmarked" part. It has a number of other meanings too, the most relevant to the student of the Chinese menu being "sesame" and "numb" — 麻油 (má yóu) is sesame oil, while 麻辣 (má là) describes the "spicy-numbing" flavour prevalent in Sichuan cuisine. 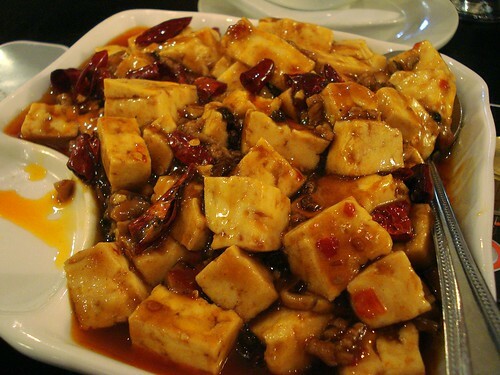 The ma-la flavour is in fact a feature of properly-made mapo tofu, since one essential ingredient of the dish is Sichuan peppercorns (花椒/huā jiāo, literally "flower pepper"), which provide the numbing element. Although in Western cuisine tofu is mostly seen as a meat substitute, mainly eaten by vegetarians and vegans, in Chinese cuisine it's an ingredient in its own right and is often paired with meat. 麻婆豆腐 is no exception; traditional recipes are flavoured with beef or pork mince. Finding a good version of mapo tofu in a restaurant can be a little tricky. If you see it on the kind of menu that lists mix-and-match dishes like beef/pork/chicken/duck in black bean sauce/sweet & sour sauce/oyster sauce/with mushrooms/with ginger and spring onion (etc etc), it's likely to be a fairly bland and uninteresting concoction of tofu cubes in a gloopy, salty sauce studded with overcooked peas. If you see it on a Chinese menu as 麻婆豆腐, though, you're probably in luck! The one pictured above is a version I ate at Royal Palace in South-East London, ordered from their Chinese-only menu. If you've only ever had the Westernised version of this dish, please don't be put off — do give the real thing a go. To make it at home, look for recipes that include plenty of Sichuan pepper, along with fermented black beans, chillies (fresh, dried, powdered, and/or as chilli oil), and the chilli bean paste (豆瓣醬/dòu bàn jiàng) mentioned in last Friday's post on fish-fragrant aubergine. Some recipes for 麻婆豆腐 use cornstarch or potato starch to thicken the sauce, while others leave it out. It's up to you which you prefer. Fuchsia Dunlop's recipe uses potato starch (and beef mince), while this recipe originating from the Sichuan Culinary Institute at Chengdu leaves out the thickener and uses pork mince. If you have any questions or corrections, please leave a comment (here's how) and let me know (or email me at kake@earth.li). See my introductory post to the Chinese menu project for what these posts are all about. 麻 (má) is the "pockmarked" part. I think this may be a case for a more-common character being used to write a word pronounced identically; I would imagine that the "proper" character is 痲, with the "illness" radical (two extra little dashes at the left of the top-left semi-enclosure). Compare http://www.unicode.org/cgi-bin/GetUnihanData.pl?codepoint=75F2&useutf8=false and http://www.unicode.org/cgi-bin/GetUnihanData.pl?codepoint=9EBB&useutf8=false . I've wondered about this too, but CantoDict includes rough/pockmarked/spotty in its list of meanings for 麻, and it does seem at least plausible that this could be related to the roughness of hemp cloth. The meanings it gives for 痲 appear to be a degree more "serious", i.e. leprosy/measles rather than just pockmarked, anaesthetised/paralysed rather than just numb. I've never seen 痲 on a menu (this of course doesn't mean that it has never appeared on a menu, particularly since a menu using simplified characters would use 麻 anyway). The meanings it gives for 痲 appear to be a degree more "serious", i.e. leprosy/measles rather than just pockmarked, anaesthetised/paralysed rather than just numb. Odd; I thought the "numb" meaning was definitely for 麻, since its meanings include "hemp" and "marijuana". It's interesting that the CantoDict page includes "痲痺", that the Unicode page for 痲 includes an entry from a Japanese-English dictionary 痲痺 = "paralysis/palsy/numbness/stupor" and that the Unicode page for 麻 includes an entry from a Chinese-English dictionary 使麻痺 = "paralyze". So it all seems rather confusing which, if either, character is "right" for that meaning. (this of course doesn't mean that it has never appeared on a menu, particularly since a menu using simplified characters would use 麻 anyway). Is that what the "痲 / 麻" on the CantoDict page implies? Odd that the Unicode pages don't map 痲 to 麻 as a simplified form. Perhaps using 麻 for everything is easiest. That's what I meant! 麻 is "numb" (less serious), 痲 is "paralysed" (more serious). Yep! Annoyingly, this makes it pretty much impossible to Google to see if anyone actually does spell mapo tofu as "痲婆豆腐", since when you Google for Chinese characters that have a simplified version it helpfully considers the traditional and simplified ones to be equivalent (which normally is what you want, just not in this case). BTW - thank you for linking to those entries. And apologies if I came over as trying to have the last word or be right; I'm genuinely confused since I thought I knew what was up based on the sources I had consulted, but it appears it wasn't as cut-and-dried as I had assumed. So I was mostly thinking out loud rather than trying to prove you wrong or something. No, it is fine! I always appreciate your comments. There's a good number of Chinese words/phrases that can be written with more than one logogram, and 麻/痳 is one of those. Both can be used to mean 'numb', though 痳 seems to be more often found in 詞. However, my dictionary (1992 version of 新华字典) is telling me that pockmocked can only be represented by 麻. Also, my dictionary indicates that 麻 is not a simplified version of 痳. The dictionary I have is the Oxford Pocket Chinese Dictionary, which doesn't include either 痳 or 痲 :( This is really puzzling me now, because I thought the whole character simplification thing was an Official Government Project, and hence not something that different sources should have different opinions on — and yet Google and CantoDict must have got it from somewhere. Looks like CantoDict agrees with your spelling! Which is interesting, since as far as I know CantoDict is all written via user contributions. Ooh, yes, I'm free that evening - that would be great! Drop me a line at kake@earth.li and I'll send you the list of places I've been planning to try. Ta muchly for this - I may not have had to read it off the menu in anything but english, but I remembered the name while ordering dinner tonight and it's the best thing I've had off the menu yet. Much tasty. Excellent! Glad to be of service. Where did you order from?